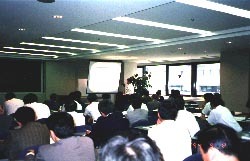 General meeting with lectures by guest speakers is regularly scheduled in May (Tokyo). Two-day biennial conference or relay-meeting is alternatingly scheduled every year. The multi-session conference is for presentation of scientific papers, covering wide range of topics, and discussion (Tokyo). The relay-meeting is held in a local city and is focused on specific selected topics. Establishment of data base on the relevant literatures and information. EICA members may access the data base for on-line data search. Technical site visits to facilities of interests are annually scheduled. Dispatching delegation to International IAWQ meetings and workshops. EICA also assists the members to submit scientific papers to these conferences and journals. Publication of Journal of EICA (J.EICA). The journal is issued twice a year in total of 4 issues each year. The objectives include to support the research and development of ica systems in the fields of environmental quality control, and actual implementation of such technologies.